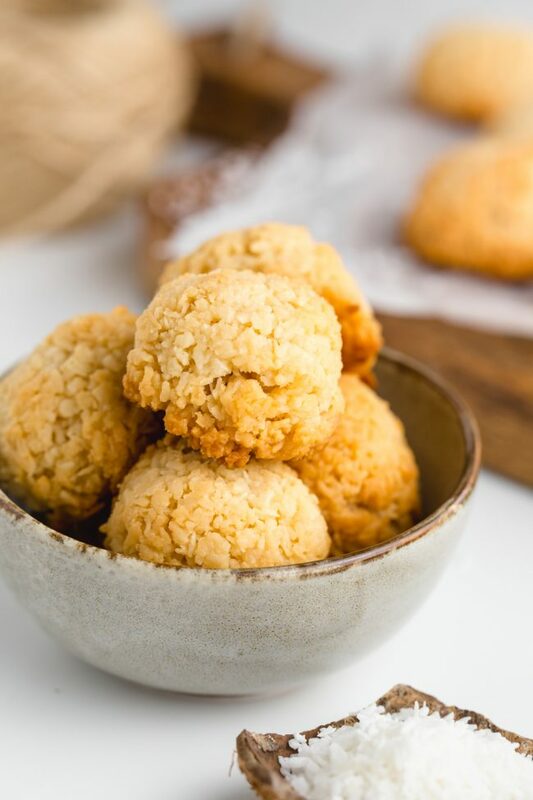 Paleo coconut macaroons that are chewy on the inside and crisp on the outside! They taste like regular macaroons but are vegan and maple-sweetened. 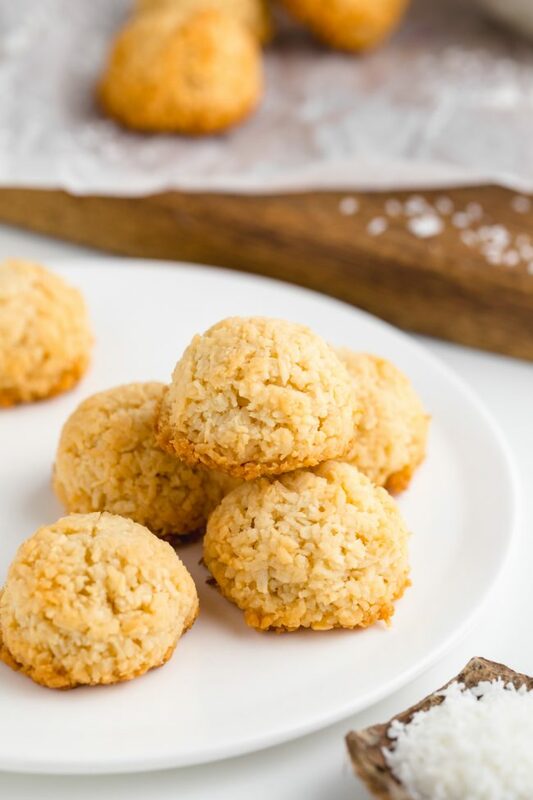 These macaroons (not to be confused with French macarons are one of the easiest cookie recipes I have! They’re probably tied with my gluten-free peanut butter cookies recipe. They require just maple syrup, coconut butter, shredded coconut, vanilla and salt. And the result is some vegan and paleo coconut macaroons that really taste just like the regular kind! No eggs or refined sugar and they’re still amazing. I think they’re a perfect healthier Easter dessert. Just like these paleo cupcakes. Some macaroons I’ve had are sickeningly sick but not these. They’re just sweet enough. I first tried making these with coconut oil, knowing that way more people have that on hand than coconut butter, but it was a huge mess. Please do not use coconut oil! It won’t work. Store-bought coconut butter is usually pretty expensive so I make my own. And it’s super easy! You just need shredded coconut and a high-speed blender or food processor. Here’s how you make homemade coconut butter. Then you can also make these peanut butter coconut Rice Krispe treats with the leftovers! And on a personal note – we finally have a babysitter! Only took 3 months to find someone. :) Hopefully she’ll stick around so I can bring you more new recipes! Questions about these paleo coconut macaroons? Can I use something other than maple syrup? I’m guessing another liquid sweetener would work fine but since I haven’t tried, I can’t say for sure. Can I use something other than coconut butter? Unfortunately not. There’s no sub for coconut butter and coconut oil will absolutely not work. Can I use something other than shredded coconut? These won’t come out properly if you don’t use shredded coconut. I don’t think flaked coconut (those are the longer strands) would work and coconut flakes / chips definitely wouldn’t work. Desiccated coconut probably would. Can I reduce the maple syrup? I used the least amount that I thought was enough. You could try reducing it by a little, but the macaroons will be drier and more crumbly. They might not even hold together. So I really don’t recommend reducing it! Do I have to let the dough sit? When I didn’t let them sit, they didn’t hold their shape as nicely. The edges were overbaked and the cookies were overall kind of greasy. I also tried chilling them to speed things up but letting them sit at room temperature for 30-60 minutes was better. In a medium saucepan over medium heat, mix together everything except the coconut. Stir frequently until everything is melted and well combined. Remove from the heat. Stir in the coconut. Let the mixture sit for 30-60 minutes at room temperature. Preheat the oven to 325 °F (163 °C) and line a cookie sheet with a piece of parchment paper. Use a 1.5 tbsp cookie scoop (the scoop is important so they have the right shape – if you don't care about the shape, you can roll them into balls and flatten slightly with your palm) to form 12 25-gram balls. Place at least 2" apart of the cookie sheet. If any bigger bits of coconut are sticking out, pat them down so that they don't burn. Bake for 21-23 minutes or until the cookies are lightly browned. Let cool on the cookie sheet and let cool completely before storing in an airtight container. They should stay good for up to 4 days. 55 comments on “Paleo Coconut Macaroons” — Add one! Macaroons were one of my favorite treats as a kid. But I have to admit, these look even better despite being healthier! Hi was wondering in the description you said “The (sic) require just maple syrup, coconut butter, shredded coconut, vanilla and sugar” yet maybe I am missing something but I do not see in the ingredients list any sugar mentions just maple syrup. Would you mind clarifying please? Thank you so much and cannot wait to make these!! Oh geez. Thank you for pointing out the typo and a totally wrong word. That should be salt and not sugar! I fixed it (the recipe was correct, the sentence in the post was just wrong). Thank you so much! Sorry for the confusion. I hope you’ll enjoy them! Wow these are amazing tastes WAY better then ones I’ve had made with bakers sweetened shredded coconut egg whites and more sugar yuk! I’m so excited to try this recipe. I’ve had a bag of coconut in my pantry for months, but I never found a good looking recipe to try Macaroons until now. I hope you’ll make them soon! Adding coconut butter to my grocery list. Wow these look great! My family will love them! WOW! these macaroons like majorly delicious! I can’t wait to try them! These look like little bites of heaven! Looking forward to making these! I can’t wait to make these! They look SO yummy! I hope you’ll love them as much as we did! I can’t wait to make these! We love macaroons! YUM! These macaroons look so delicious!!! I haven’t made macaroons in awhile and a new recipe seems like the perfect opportunity! An absolute favorite of mine! I am a huge coconut fan so I love macaroons! I bet you’d love these! Macaroons are my favorite dessert. I love how simple this recipe is. Thanks for sharing they look delicious! I hope you’ll get to try them out! One of my all-time favorite sweet treats! I love that these aren’t overly sweet and have to make them this weekend!! I hope you’ll love them as much as we do! They are my absolute favorite snack/dessert and I’m so going to try your recipe. Your instructions are very helpful; I am excited to make these! My kids love coconut! I’d love to hear how they come out! Hello! I only have one, paleo vegan chocolate ice cream, but it’s a really delicious one. :) And you don’t need an ice cream maker. It’s not sugar-free (almost none of my recipes are) but perhaps you could find an alternative low-carb sweetener. YUM! 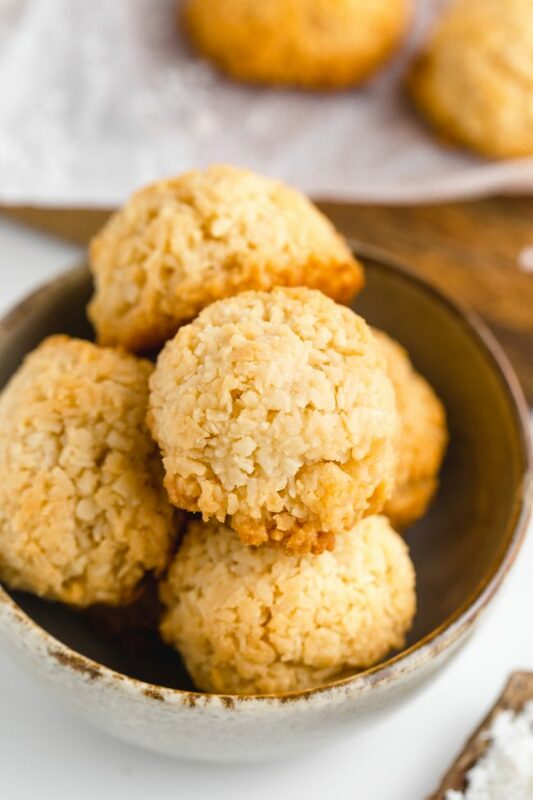 These coconut macaroons look so delicious! Wow! What a generous sharer you are, Erin! 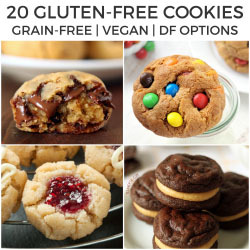 So wonderful to find these GREAT recipes for me (GF) and grandboys (GF and DF), and it’s especially awesome that you use alternative sweeteners! Thank you, thank you! Everything I’ve tried of yours has been SO DELICIOUS! Thanks so very much for sharing! 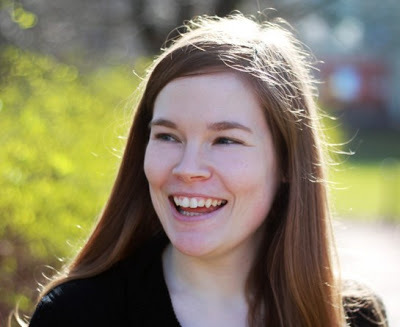 If you publish a cookbook, sign me up! I’m still “old school” and enjoy having them! I’m really happy that you’ve been enjoying the recipes and that you can share them with your grandsons! I probably won’t write a cookbook but I’m glad that you’d want one. :D Thanks for your nice comment! I don’t have that info but you could use this recipe analyzer for the nutritional profile. :) I hope you’ll enjoy the cookies! I’d love to hear how they come out. 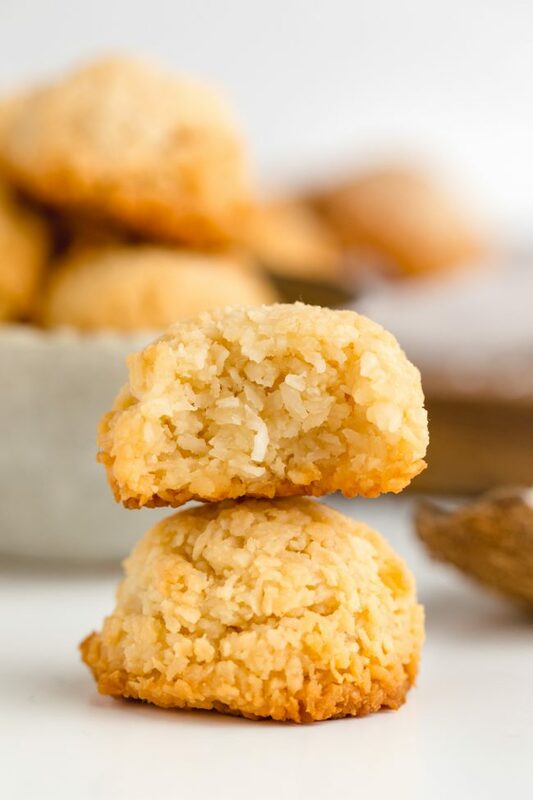 Can’t wait to make these Paleo Coconut Macaroons & will definately rate them asap! Do you know what the nutritionals are? I have all these ingredients so I am going to make these for Passover & it is coming up quick. Erin replies to Terri K.